Tiny Wings is about momentum, reaction time, flying, and an adorable bird all at the same time. It's a fun experience and it only takes one button to play. Well, one touch at any rate. 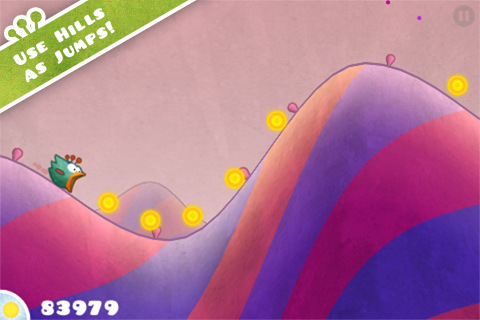 In Tiny Wings the world is made up of islands and each of these islands has a series of hills on it. Your goal is to help the bird cross as many islands as possible in one day. With a touch of the screen the bird folds his wings and gains momentum downhill. When you release your touch the bird flaps his wings and tries his best to soar majestically with the momentum he's gained. Stringing together hill jumps makes the bird go exponentially higher and farther. It's a simple gameplay mechanic that I can't seem to get enough of. The sense of accomplishment I get from executing jumps successfully is amazing. The game not only has cute graphics, but they're procedurally generated too. The hills and islands change colors and designs every day. That's pretty sweet for an indie game to do. This is my favorite 60 second game right now. I've been playing it every night before bed on my ipod touch. Having a gameplay session that's satisfying and quick has been essential lately because of my busy schedule. I want a complete gaming experience in one minute, because sometimes that's all I can afford to spare. 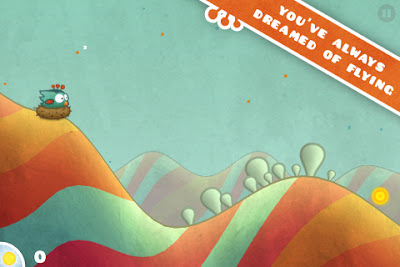 In this respect, Tiny Wings delivers a perfect experience at only 99 cents. Check it out on the app store or, if I haven't sold you on it yet, take a look at the video below.